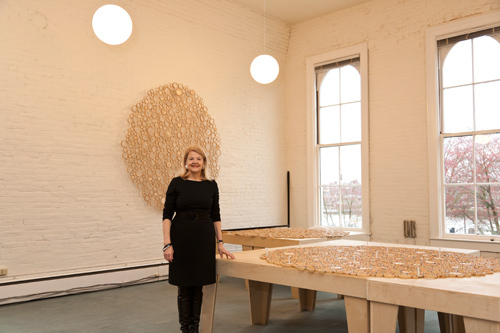 Artist, cultural entrepreneur, and civic leader, Anne Crumpacker finds "deep order and connection" in the material of bamboo. 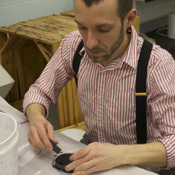 Anne Crumpacker MFA ’11 is a Portland artist who has found a singular focus in her practice through bamboo, a material that continually supplies her with inspiration and challenges. 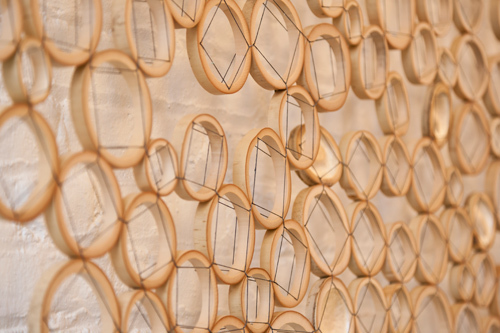 In choosing bamboo to create her work—which ranges from lacy geometric wall pieces that reveal the intricate cell structure, to substantial undulating grids of cross sections—Crumpacker has embraced centuries-old traditions as well as a 21st century mindfulness of sustainability. 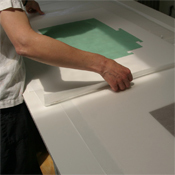 In 2011, Crumpacker was in the first graduating class from the MFA in Applied Craft and Design program, jointly run by PNCA and Oregon College of Art and Craft, and her career was immediately launched with pieces selling from her practicum body of work, subsequent commissions, and a recent show in Museum of Contemporary Craft’s Gallery. Next fall she will be part of a group bamboo show at the Portland Japanese Garden with two artists who helped guide her work, Charissa Brock and Jiro Yonezawa. Anne Crumpacker in her SE Portland studio. Photo: Matt Miller ’11. Lovely and versatile in many ways, bamboo has also proven to be a material requiring endless patience and problem solving skills. 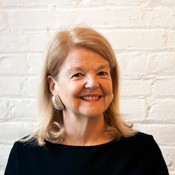 Crumpacker laughs when she thinks of the advice she might get from her early mentors Mike and Doug Starn, artists internationally recognized for their ambitious exploration of themes of chaos, interconnection, and interdependence. 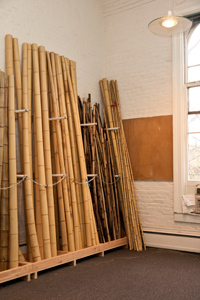 Crumpacker met the artists while visiting their studio in New York to see their enormous, ever-evolving bamboo installations. The pieces, part architecture, part performance art, are networked through cantilevered bamboo poles lashed together into towers 50 feet high and are built without any scaffolding or outside support. Raw materials in Anne Crumpacker’s SE Portland studio. Photo: Matt Miller ’11. Inspired, Crumpacker spent the summer of 2010 as an intern on the The Big Bambu, the Starn brothers’ massive bamboo installation on the roof of the Metropolitan Museum of Art. Crumpacker’s summer spent with the Starn brothers and their team of artists and rock climbers is just one chapter of her journey as an artist. She traces her first pivotal artistic moment to a chance encounter with a bamboo sculpture 20 years ago in Tokyo. The piece at the Sogetsu School of Ikebana was also a monumental structure using fresh cut bamboo by renowned Japanese filmmaker Hiroshi Teshigahara. Crumpacker is quick to rattle off bamboo’s qualities—its strength, flexibility, geometry, elegance and, she adds, “It’s the most sustainable material on the planet. 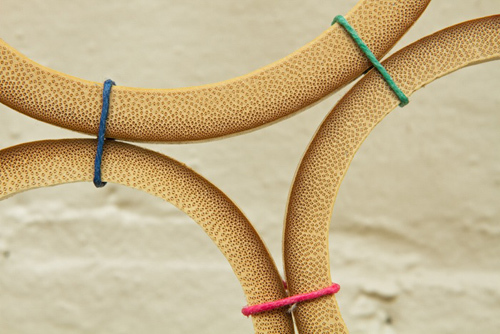 It’s been on earth for 40 million years.” Along with the natural grace and beauty of bamboo, working with the material connects Crumpacker to what she calls the interwoven community of people who have worked with bamboo for thousands of years. After that transformative encounter with bamboo, Crumpacker continued her artistic exploration—taking classes with Japanese master basket maker Jiro Yonezawa, as well as Continuing Education classes at PNCA. It was a chance statement by an instructor at PNCA that would resonate and eventually, change the structure of her life. Crumpacker feels she had postponed becoming an artist because, “I was a professional volunteer, which I felt was a significant contribution.” Pre-art school, Crumpacker was a substantial presence in the Portland arts community serving on many boards including those of the Portland Art Museum and George Washington’s Mount Vernon Estate and Museum. She is still on the board of the Mount Vernon Ladies Association, stewards of George Washington’s Estate, Museum and Gardens, serving as the Vice Regent for Oregon. 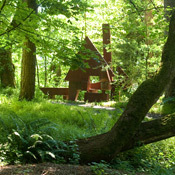 Additionally, Crumpacker’s family has made deep and significant contributions to Portland’s cultural and artistic landscape. Crumpacker notes, “I decided at that point what I wanted was to devote the rest of my life to my creative practice.” Here she pauses to smile and cites Agnes Martin, who continued her studio practice into her 90s, regularly painting three hours a day, as an inspiration. So at a point in life when many are winding down their obligations, Crumpacker embraced the discipline of graduate school where she found her work continually challenged and pushed. A detail of one of Anne Crumpacker’s Luminaries. Photo: Dan Kvitka. Since bamboo is so ubiquitous, her mentors—among them Portland bamboo artist Charissa Brock—pushed her to find new ways to use the material. It was at this point that Crumpacker had what she called an epiphany, as she turned the cross cut pieces on their side to create a wave pattern. The new way of working with the material flowed into a series of work including her Luminaries, wall-hung pieces lit from behind. 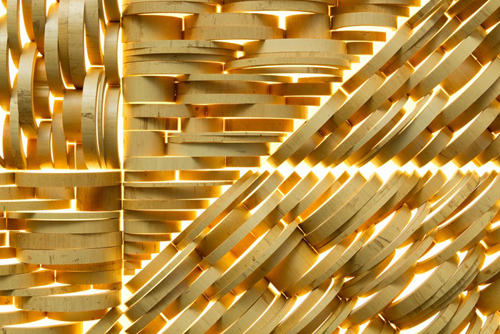 Within the field of artists working in bamboo, this new approach represents a unique artistic statement and is something Crumpacker is beginning to investigate in terms of design and architecture.